The Indian Rocks Beach in Florida is located on a shoal between the Gulf of Mexico and the Intracoastal Waterway of the West Coast of Florida. It is a relatively small city that was incorporated in 1956. To its north lie the Belleair Shores and the Belleair Beach. To its south are the Indian Shores and the Redingtons. The Tampa International Airport is about 45 minutes away to the east. 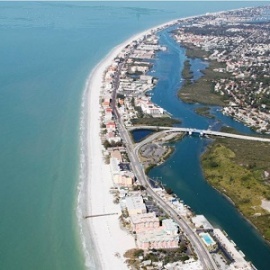 Despite the small land area of Indian Rocks Beach, only about 480 acres, this tourist destination offers a wide variety of attractions and surprisingly diverse types of accommodations, from the usual hotels and beach resorts, to high-rise waterfront condominiums, beach cottages, and townhouses. Some of the notable places to go in Indian Rocks Beach are the Museum of the Indian Rocks Area Historical Society, the Beach Art Center, Suncoast Seabird Sanctuary, and the Clearwater Marine Aquarium. The Museum of the Indian Rocks Area Historical Society showcases the history of all the cities on the island. The Beach Art Center offers workshops for crafts and the visual arts. The Suncoast Seabird Sanctuary protects avian wildlife, including herons, pelicans, and cormorants. And the Clearwater Marine Aquarium features river otters, loggerhead sea turtles, bottlenose dolphins, and other marine creatures. Besides learning about the City of Indian Rocks Beach and how to protect the environment, tourists will have an exciting time exploring, cycling, boating, and fishing. There are also rows and rows of novelty stores, gift shops, and boutiques where tourists can buy souvenirs. After shopping and exploring, the visitors of Indian Rocks Beach will enjoy culinary delights offered by numerous restaurants, clubs, bars, and lounges. The finest dining is offered by nearby gourmet restaurants such as the Wine Cellar, the Lobster Pot, and the Island Way Grill.